The Eameses’ influence on American style and taste is so profound as to be almost indiscernible. But every time we pick up a Pottery Barn catalog, snap together a shelf from Ikea, or spread out a rug from Pier 1, Charles and Ray Eames are not far away. In part, this is because of their design philosophy, which was founded on finding lasting solutions to fundamental needs, but also because they worked closely with large corporate and government entities to expose their design solutions to as many people as possible. 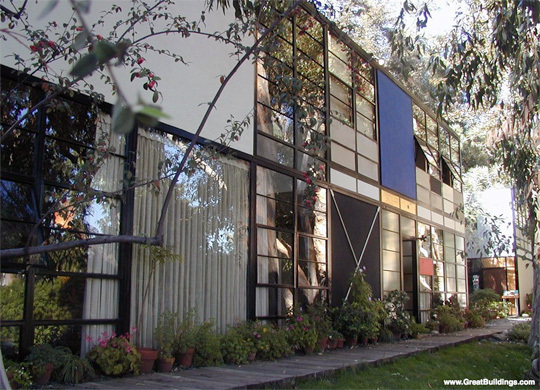 The Eames House, Case Study House #8, was one of 25 homes built as part of The Case Study House Program. The program came into being in the mid-1940s and continued through the early 1960s, largely through the efforts of John Entenza, publisher of Arts and Architecture magazine. The magazine announced that it would be the clients for a series of architect-design homes to be built and furnished using materials and techniques derived from the experiences of the second World War and best suited to express man’s life in the modern world. Each home built would be for a real or hypothetical client taking into considerations their particular housing needs. The first plan of their home, known as the Bridge House, was designed by Charles Eames and Eero Saarinen in 1945. Because it used off-the-shelf parts ordered from catalogues, and the war had caused a shortage in materials delivery, the steel did not arrive until late 1948. By then, Charles and Ray had “fallen in love with the meadow,” in Ray’s words, and felt that the site required a different solution. Charles and Ray then posed themselves a new problem: How to build a house with maximized volume with the same elements and not destroy the meadow. Using the same off-the-shelf parts, but ordering one extra steel beam, Charles and Ray re-configured the House. It is this design which was built and remains today. Charles and Ray moved into the House on Christmas Eve, 1949, and lived here for the rest of their lives. The interior, its objects and its collections remain very much the way they were in Charles and Ray’s lifetimes. The house they created offered them a space where work, play, life, and nature co-existed.